and her little girls at Augustus. I went there this P.M. The graining of the woodwork and doors in the downstairs of the house was completed today. As noted earlier, graining is the painting of a surface to resemble wood. In 1851, popular taste dictated that wood trim from simple pine or ash or other tree be grained to resemble a dressier wood such as mahogany, or curly maple. The illustration above, from a modern decorating company that offers “faux bois,” as graining is also known, shows a hand-painted example of flame mahogany. The talented Mr. Scott finished his work today, for which Evelina paid him $12.25. In today’s dollars, the “labor value” of that compensation is $2,680, according to one economic source. ** That value is computed using a wage index for unskilled labor; the computation for a production worker compensation would be even higher. That Evelina made note of the expenditure in her personal journal suggests that she thought it was noteworthy – in her own opinion, she either paid too much or she got a good deal. I suspect the former! Social life went on as usual today. John and Susan Peckham were back in town and stopped in to see Old Oliver and Sarah Witherell. Evelina’s sister-in-law, Henrietta Williams Gilmore, came into the village from the farm and brought old Mrs. Gilmore to Mr. Torrey’s to visit Alson “Augustus” and Hannah Gilmore. Henrietta also brought along her two youngest children, eight-year-old Henrietta Hall Gilmore and six-year-old Helen Jane Gilmore. The two girls were actually half-sisters of 29-year-old Augustus. Their mutual parent, Alson Gilmore, had a spread of seven children from two wives. 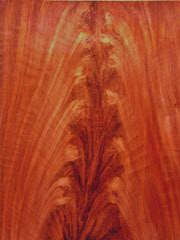 * Image of mahogany-style graining, Courtesy of http://www.statusfaux.com, Great Neck, New York.